This ChloBo set of 2 bracelets are made from 925 sterling silver. Each bracelet features a small charm which adds a touch of fun to each bracelet. 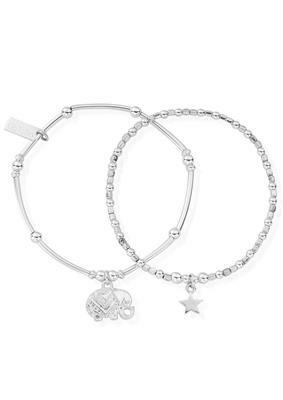 Symbolising good luck and wishes, the bracelets feature both an elephant and a star charms. Wear these bracelets alone or add them to your ChloBo bracelet stack to add a delicate and beautiful touch.